Shortly after revealing Rashid, Capcom announced at Tokyo Game Show 2015 that Karin Kanzuki, last appearing in Street Fighter Alpha 3, will be returning in Street Fighter V. You can see her in the trailer above, alongside the new Kanzuki Estate stage. 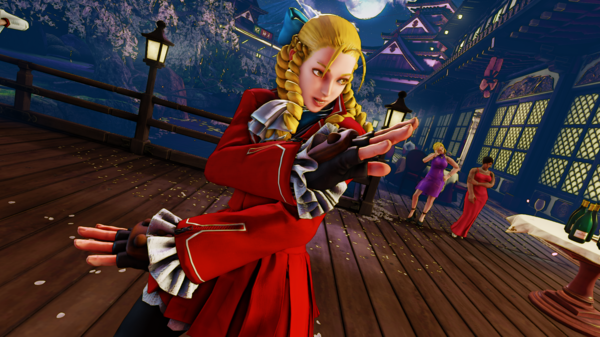 Karin lunges forward with a devastating palm strike that dissipates projectiles and knocks down the opponent if it connects, all while helping to build her V-Trigger gauge. By holding down the buttons, players can charge the move for a split second, giving it better hit and block properties. Karin channels her inner Ki to unlock the true potential of the Kanzuki fighting style, giving her access to the Guren Ken attack, which in itself possesses over half a dozen different follow ups and variations. After the initial Guren Ken, she is able to transition immediately into an overhead attack, a low sweep, a flying throw, another quick set of strikes, or even a backdash to bait out counterattacks. This gives her immense flexibility in controlling the flow of the fight, ensuring that she comes out on top. Capcom also announced that the Capcom Fighters Network (CFN) is the official community destination integrated into the online infrastructure of Street Fighter V.